Now that I found your website and clicked on hyperlink after hyperlink, I've found what I've been looking for to help others. I am a medical provider that has been struggling learning how to educate patients on causes of chronic pain. We know that those with difficult backgrounds, a history of emotional/physical abuse, poverty, etc are much more prone to chronic physical "functional" pain. I have never figured out a good way to explain this to people, and I have also never had an AFFORDABLE treatment for them. Massage therapy and acupuncture are not covered by Medicare/Medicaid. So now that I've found this website I'm going to continue expanding my own foam rolling and will incorporate your teachings into my practice to help others. Thank-you so much for taking the time to reward me and my efforts with your lovely comments! I am so happy that you have discovered foam rolling and myofascial release to be as healing as I have! There are many more of us that are in this camp, adding to the healing numbers, each and every day! And yes, foam rolling is often referred to as the "Poor Man's Massage" but it's effects, for something so amazingly simple, is so incredibly healing. If only everyone knew of this! So, share the Healing Love! Namaste to you, my health care companion! Return to How Emotions Affect Our Body. Thank you so much for considering a donation to help support this website. I appreciate your thank-you for access to so much free information. It is because of you, that I also am able to assist others who do not have the means and who are unable to afford my consultative services. If you feel you have been blessed by this website, thank-you for your donation! I promise, that I will continue to provide you with lots of information and pay it forward to all in whatever way I can! Protected by Copyscape Plagiarism Checker ~ Do not copy content from this page. Information on this website is not intended for medical advice. See your health care provider for any health concerns. 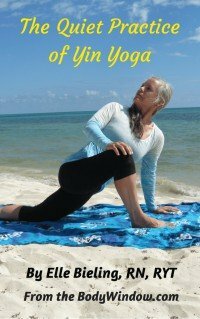 By using this website and/or practicing any yoga postures, foam rolling exercises or other physical movements contained herein, you are agreeing that you are in good health, cleared by your healthcare professional to participate in physical activities and you release The Body Window from any liability involved in the practice. Learn the Stillness Practice of Yin Yoga for the ultimate in body awareness for healing! Click here for the book! Why should you have open and balanced chakras? Click Here to learn why. Balance your Chakras in only 15 minutes/day, the Body Window way! Click Here to learn more! All Banners and Amazon links on this website are affiliate links. As an Amazon associate The Body Window website will earn from qualifying purchases when you click on these links. I have used and love all of my product recommendations and am sure that you will too! I sincerely thank-you for your purchase! The body-mind connection is a powerful and universal force that exists in your life, often without your being aware of it. It is the main driver of your health, whether you realize it or not. My videos are guided meditation videos that you will do with the aid of your physical being ~ your body, to lead you to health and healing of your entire being ~ your body-mind-soul. Do not copy content from this page.